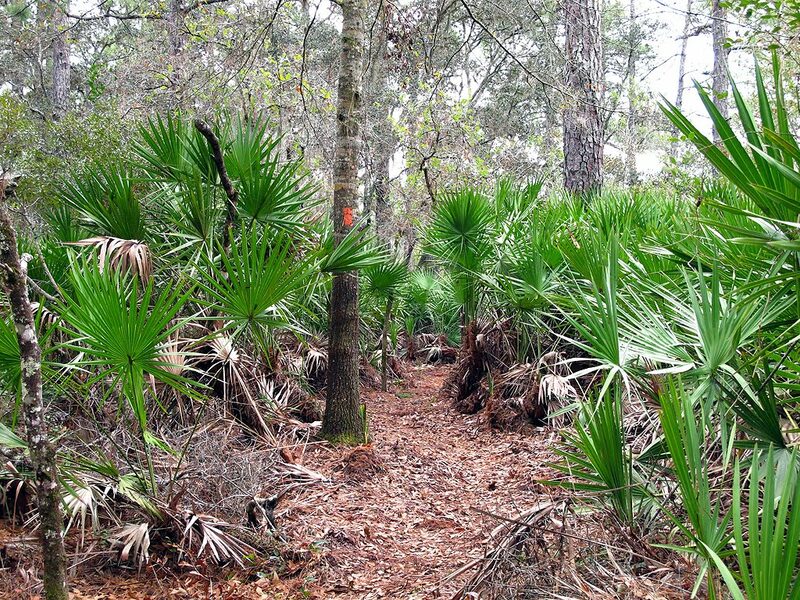 The Chuluota Wilderness Area is made up of 620 acres, consisting of many ecosystems. Bordered by both private property and the Charles Bronson State Forest, this wilderness area is provided for public use by Seminole County. As of this January, 2011 writing, the only way to access the parking area provided is off of Curryville Road. Finding Curryville Road itself may prove to be a challenge, it is off Lake Mills Road. 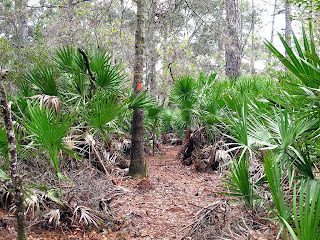 Hikers may expect to find blazed trails located in the area, along with a number of old roads and game trails for exploration. The County has no problem with you venturing out on your own. The whole area is surrounded by a barbwire fence (to keep cattle out), so it is hard to get lost. One of the borders has large powerlines running through it. I recommend using the powerlines as a trail marker, if need be, they will always lead you back to the parking lot. 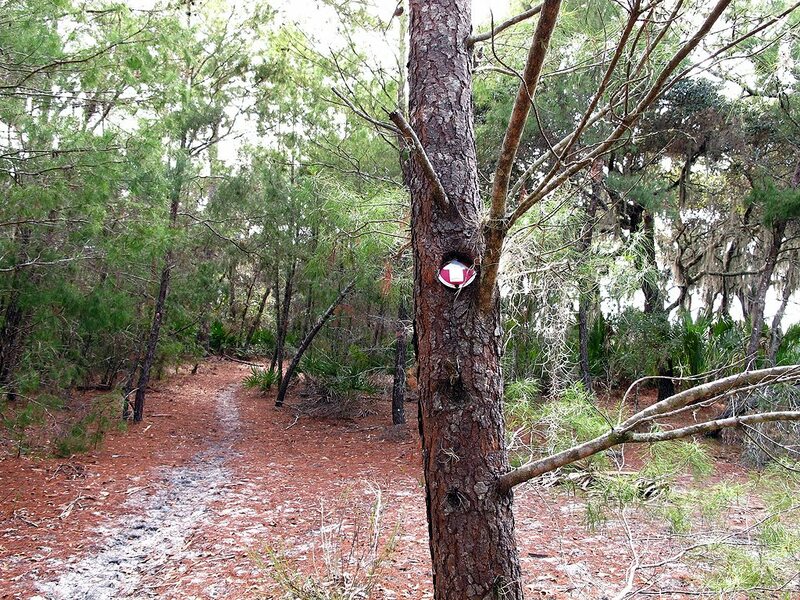 Another border, marked by barbwire, is the Charles Bronson State Forest. This is public area also, so you can venture into there if you wish to cross the barbwire. Other borders are made up of private property, so stay off them. There are two blazed trail systems located in this wilderness area. 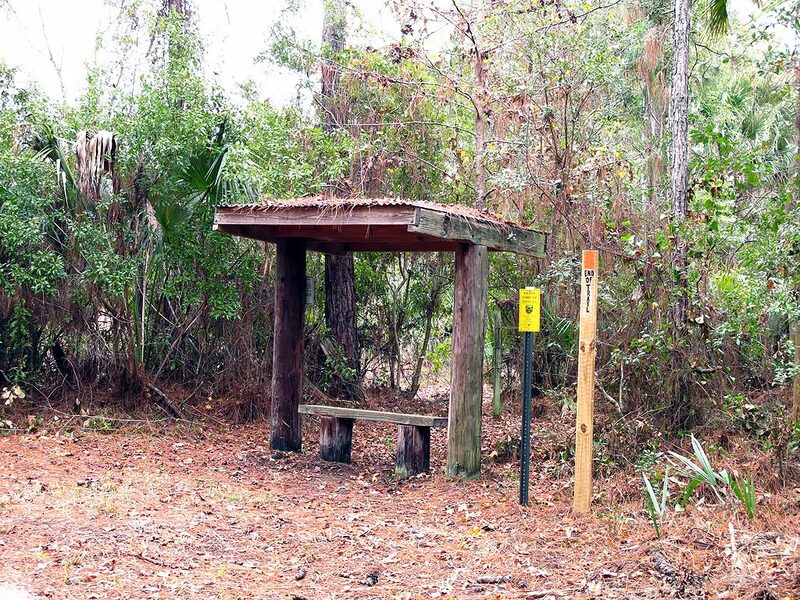 The first, created by Seminole County, is a quaint older system denoted as the West and East Loops. Both of these loops are blazed with red metal markers embossed with white arrows. 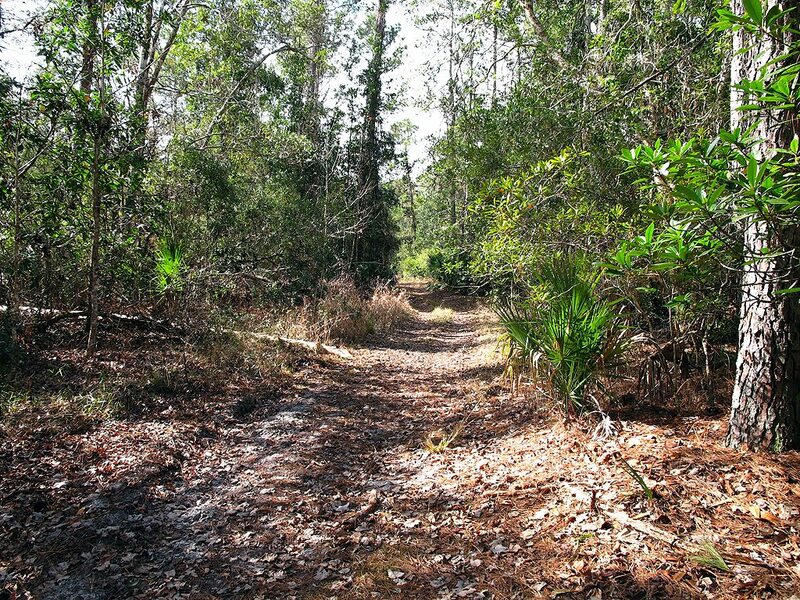 The second is a newer trail system created by the local Florida Trail Chapter. This trail is blazed using orange paint. 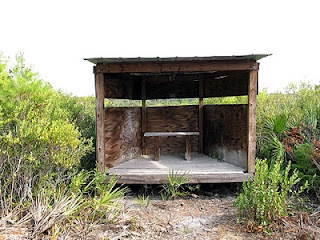 It is proposed to be part of the complete Florida Trail system, connected to the system out of Charles Bronson State Forest. 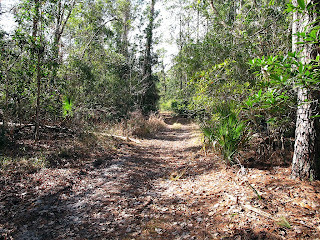 Within this Wilderness Area, I hiked the complete section of the Florida Trail during my visit, a little over 2 miles. 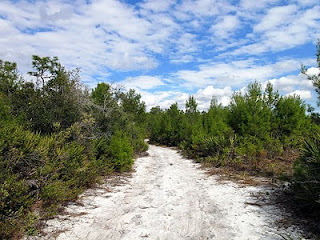 It is a very pretty, well maintained trail. Its only quirk is that it ends at a corner of the Wilderness area. Rest assured I am not misleading you; there is a covered bench and a post that reads “End of Trail”. We can only wait for the rest of the trail to be continued. The FT pathways are well marked and well maintained and open to foot traffic only. 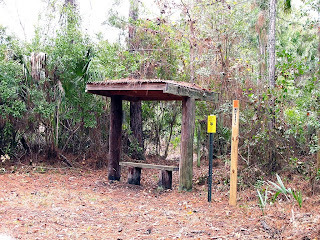 The Florida Trail group has even provided a sturdy small bridge structure to cross a wet area. The only section I didn’t care for was the last part, that consisted of a chewed up fire road. The other set of trails established and maintained by the County have been pretty much ignored for a while, many of the markers are gone or have actually grown into some trees. The County uses red metal tags embossed with white arrows as “blazes”. Many have faded or altogether disappeared for some reason. I found that portions of the trails along the West Loop are just a pleasure to hike, while other sections are located on sandy, open roads. The East Loop also has some nice sections offering much serenity. As you wander through you will find yourself on some exposed fire roads as well. The County has positioned some covered benches, as well as a scattering of open benches throughout the area. 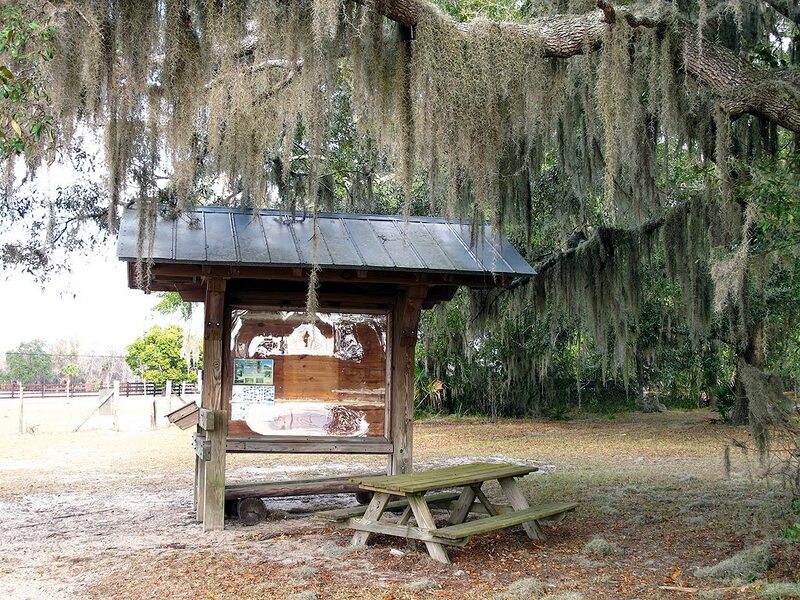 There are several picturesque settings, perfect for an artist to set up an easel to capture. I highly recommend that you venture down some of the grassy roads which crisscross the area; these are very nice to hike. I also ventured down some game trails to look around. I mentioned earlier that the barbwire kept out the cattle, so you can walk care-free from their droppings. As always, I recommend a GPS to keep track of your current location and also the parking area.